From Bill Minutaglio and Steven L. Davis, authors of the PEN Center USA award-winning Dallas 1963, comes a madcap narrative about Timothy Leary's daring prison escape and run from the law. Aided by the radical Weather Underground, Leary's escape from prison is the counterculture's union of "dope and dynamite," aimed at sparking a revolution and overthrowing the government. Inside the Oval Office, President Richard Nixon drinks his way through sleepless nights as he expands the war in Vietnam and plots to unleash the United States government against his ever-expanding list of domestic enemies. Antiwar demonstrators are massing by the tens of thousands; homemade bombs are exploding everywhere; Black Panther leaders are threatening to burn down the White House; and all the while Nixon obsesses over tracking down Timothy Leary, whom he has branded "the most dangerous man in America." Based on freshly uncovered primary sources and new firsthand interviews, THE MOST DANGEROUS MAN IN AMERICA is an American thriller that takes readers along for the gonzo ride of a lifetime. 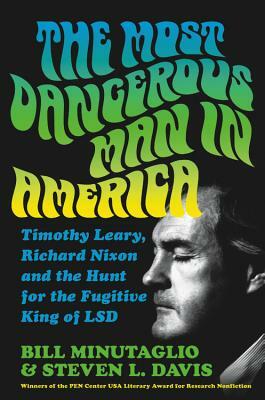 Spanning twenty-eight months, President Nixon's careening, global manhunt for Dr. Timothy Leary winds its way among homegrown radicals, European aristocrats, a Black Panther outpost in Algeria, an international arms dealer, hash-smuggling hippies from the Brotherhood of Eternal Love, and secret agents on four continents, culminating in one of the trippiest journeys through the American counterculture. Bill Minutaglio is the author of several books, including Dallas 1963, for which he won the PEN Center USA Literary Award for Research Nonfiction with Steven L. Davis. His work has appeared in The New York Times, Washington Post, Newsweek, and Esquire. Steven L. Davis is the PEN USA-award winning author of four books focusing on iconoclasts, including Dallas 1963 with Bill Minutaglio and J. Frank Dobie: A Liberated Mind. He is the president of the Texas Institute of Letters and a curator at the Wittliff Collections at Texas State University in San Marcos.